You clear my mind. You relax me. You are my only "me" time and I you so much! I tend to be quite an introvert and really value alone time..... I think that comes from being an only child and spending so much time entertaining myself growing up. So running is the perfect sport for me. No classes to rush to, to be late for. And it's such a variable exercise- feeling sluggish? Just take a slow jog and see how it goes. Feeling energetic? Go for a PR time! Just have a 30 minutes? Go for a quick 3 miler. Have a whole morning to yourself? Go for 12 miles- two hours of deliciousness! Last week was a bit crazy and I did not get one. single. run in! It was terrible. But I decided to do all I could to make this week better and carve out some me time. Both Sunday and Monday nights, after dinner, as the sun was going down, I set out and got 4 miles in. It was fabulous! 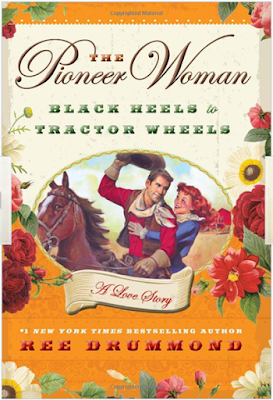 Made even better by the audiobook I checked our from the library Friday- Ree Drummond reading her book "Black Heels to Tractor Wheels". I of course have read most of the story on her blog, but there is something about hearing her read it out loud- her fellow Okie twang just draws me in and makes me feel like a good friend is re-telling a story to me. I read itin like two days....loved it! SO glad you made time to run this week! !